This report takes a look at how growth in public cloud is driving demand for wholesale colocation. How sustainable is this demand? Should we be bullish or bearish? Use our coupon code “openspectrum10” to save on your order! It is hard to miss these days how the aggressive growth in public cloud infrastructure is driving demand for wholesale colocation. This probably should not come as a big surprise. Hosting and cloud infrastructure providers have for many years been significant growth drivers for data centre operators such as Equinix, Digital Realty Trust, Interxion and others. They have been and remain a steady and healthy contributor to the demand profile for colocation as they increasingly focused less on building out the underlying infrastructure and more on innovation and operations. The emergence of massive-scale public cloud has re-shaped the infrastructure services market and the impact can’t be ignored. The numbers say it all. Amazon is growing at an exceedingly aggressive clip – around 60-70% y/y on billions of revenue – and now challengers such as Microsoft, Alibaba and Google are pushing forward as uptake of cloud continues to accelerate. But cloud is not something elusive and intangible. It is physical and concrete. All cloud infrastructure needs to be housed in a physical data centre. And this has translated – almost suddenly – into spiking demand for wholesale colocation capacity. Speed to market, local market expertise and scale and cost e ciencies are just some of the factors pushing clouds to use colocation. To illustrate this dynamic, Amazon is said to currently have a data centre footprint that consists of 72% leased facilities and 28% owned. It is fair to assume that this split was slanted more in favour of proprietary facilities even just a few years back. It is unclear how Microsoft and Google’s footprint might compare though IBM is another provider that uses leasing very heavily. But it is fair to assume that the current trend is slanted towards leasing. At Goo- gle and Microsoft, for example, we are familiar with dedicated data centre sta focused on scoping and procuring colocation services. Data centre operators, particularly those with wholesale capabilities, have reaped the benefits in this welcoming environment. Pipelines are busy, growth rates are up, stock prices have risen and investment interest is high. The big question now – something both investors and Wall Street analysts are currently debating – revolves around sustainability. 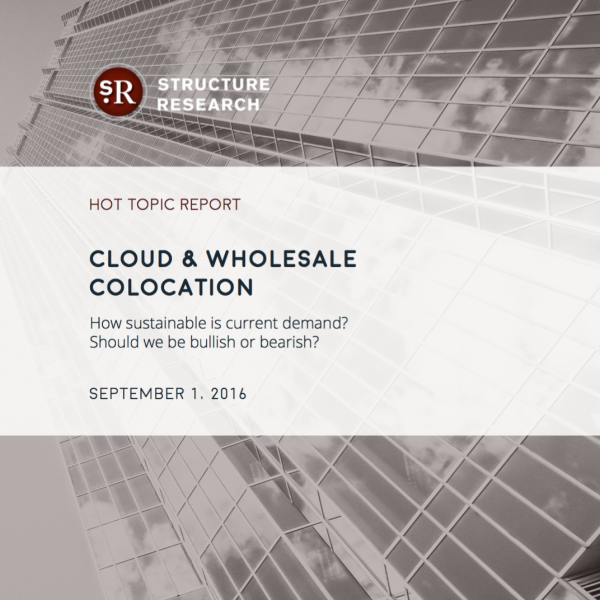 How long can we expect cloud to be a driving force behind wholesale colocation demand? Is it a short-term blip created by frenetic growth that will quickly subside? Or is this a relatively permanent shift in the market that is going to keep demand at very high levels for the foreseeable future? Are we bullish and long on public cloud demand for wholesale colocation? Or are the bears going to have it right? We present some of the arguments – bullish and bearish – and draw some conclusions.